Do I need a Salvage Title? Buying or selling a vehicle and the process of transferring the title can be complicated. Below are basic guidelines to help you with the process. Never buy a vehicle if the seller can't show you the title in his name, unless you can verify that the title is being held by a bank or credit union. Make sure all previous liens have been properly released. Each state has different requirements, so call our office for specific information. 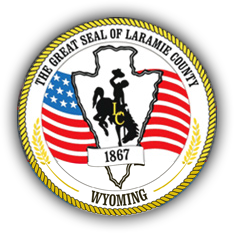 You must be a Wyoming resident to obtain a Wyoming certificate of title. Your physical residence address must appear on the title. All persons whose names are on a Wyoming certificate of title must sign to sell a vehicle. Even in cases where two names are joined by "OR" (example, John or Jane Doe), both parties must sign the seller's block on the reverse side of the title and both signatures must be notarized. Always bring photo identification with you when visiting the Titles office. By state law, the County Clerk issues certificates of title and the County Treasurer collects sales tax and registration (or license plate) fees. For an estimate of your registration fees, use the Treasurer's Cost Estimator.